It is not every day that the president of Israel writes about your work on his Facebook page. When Dr. Danny Brom, founding director of Metiv | The Israel Psychotrauma Center, made Aliyah to Israel from Holland in the late 1980’s he was told “but we don’t see trauma in our clinics.” Coming just 15 years after the horrors of the Yom Kippur War, this statement shows how for years Israeli society was unwilling or unable to confront the emotional and mental price paid by those who risked their lives to defend our country. 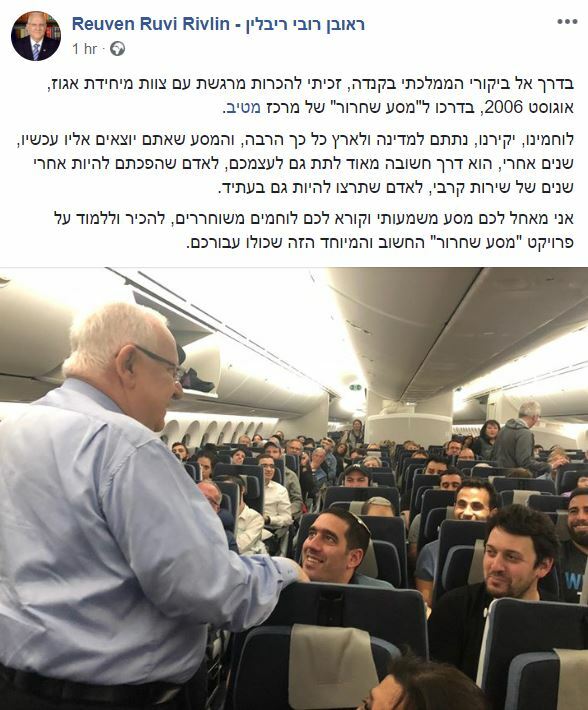 Contrast this picture with President Ruby Rivlin, who in a Facebook post this week, shared his support and best wishes for a group of IDF veterans who met him on the ELAL flight on their way to our Peace of Mind program taking place in Toronto. The Peace of Mind program is a nine-month therapeutic intervention in which Metiv therapists provide a space and time for IDF veterans to process their combat experiences in a supportive environment, including a week spent hosted in a Jewish community abroad. The veterans emerge with strengthened emotional and mental health, allowing for a healthier transition from military to civilian life. The engagement of Diaspora Jewish communities in the healing process, where they open their doors and hearts to Israeli veterans by hosting them for a week of group therapy, is not taken for granted by the veterans, most of whom are not familiar at all with Jewish life outside of Israel. Hosted in pairs with local Jewish families, oftentimes their first question when they enter a home is ‘thanks, but why are you opening your doors to us’? Over the course of the week the veterans experience firsthand the vibrancy of Jewish life and identity outside of Israel. They begin to realize that their sacrifice and service matters not only to Israelis but to Jews worldwide. At the same time, members of the host community have the chance to forge close relationships with the veterans; it is not uncommon for them to fly to Israel later on to attend the wedding of a veteran that they hosted. As a professional working for the program, I welcome the publicity generated by our beloved President’s Facebook post. And yet – it is a double edged sword. In his post President Rivlin called upon other IDF veterans to also take care of themselves, and to learn more about Peace of Mind. And indeed, in the two days since his Facebook post went up we have received over ten inquiries by units interested in joining the program. These ten units join another 100 units that have already been approved for the program and are now on our waiting list for a host Jewish community. We do not do any publicity in Israel. The units that apply for our program hear about it solely through word of mouth. The burgeoning interest in our program, along with the popularity of TV shows such as ‘When Heroes Fly’ testifies to the willingness of Israeli society to begin talking about the emotional and mental cost carried by our soldiers and veterans. This is a very good development, as it enhances the resilience of our society. At the same time, it shows how their needs are not being met, and how we as a society and a people owe our veterans better. 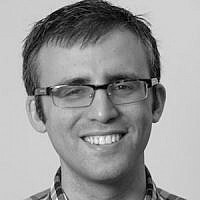 Chaim Landau is Director of Partnerships for Metiv | The Israel Psychotrauma Center. He lives in Jerusalem.